Prof. Datuk Ir. Dr. Wahid Omar (Vice Chancellor of UTM), Assoc. Prof. Dr. Hamdan Said (Deputy Director of UTM International), Assoc. Prof. Dr. Othman Che Puan (Director of UTM Marketing) and Prof. Dr. Hadi Nur (UTM International Fellow) visited Ministry of Research, Technology and Higher Education, Ministry of Public Works and Housing and University of Indonesia. The meetings involved introducing UTM as one of research universities in Malaysia. Prof. Datuk Ir. Dr. Wahid Omar, Vice Chancellor of UTM, provided insights into the various research and teaching activities at UTM. Particular emphasis during the meetings was placed on issues dealing with strategic collaboration between UTM and various institutions in Indonesia. The meetings concluded with discussions on future areas of cooperation and collaboration between UTM and institutions visited. 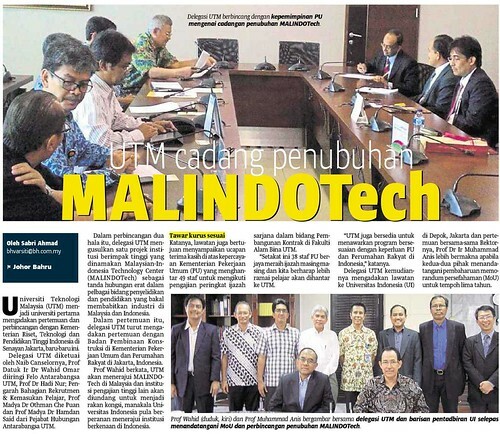 [Photos] With Prof. Dr. Muhammad Nasir (centre), Minister of Research, Technology and Higher Education, The Republic of Indonesia, and news covered by media on this visit.